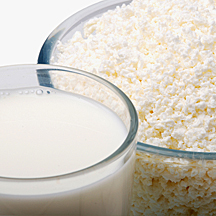 Powdered milk reconstitution for single pass or batch recycle processing. The reconstitution of Milk Powders, including NFDM, whole milk, caseins, whey protein, lactose, or other milk powder products, can be rapidly accomplished using the VACUCAM® EJM 2000 skidded unit. Our VACUCAM® EJM 2000 provides a very versatile system for NFDM single pass or batch recycle processing to a single silo or batch tanks or to multiple use points. The VACUCAM® unit provides 100% rapid rehydration. Depending on the unit size selected, powder rates of 300 to 550 lb./minute are typical with larger units capable of conveying and processing in excess of 1000 lb./minute. The unit will typically process 30%+ NFDM solids on a single pass with much higher solids achieved on batch recycle.A major challenge in NFDM dairy operations when adding dry powders to fluid milk to increase solids levels is in controlling finished product temperature. The VACUCAM® process will fully hydrate milk powders into cold milk or water and the resultant product is able to be used immediately. The combined savings in time and energy is phenomenal!The design of the dry side feed system becomes extremely important to maintain the delivery rate to the VACUCAM® Ejector Mixer System. Bulk bags are discharged dust free into PH Bulk Bag Surge Hoppers (90, 140 or 165 cu. ft. capacities). The rate of unloading the bulk bags becomes the critical factor for meeting the design capacity for the process. The dry side can be designed with a single bulk bag unload hopper, dual bulk bag hoppers alternating delivery to the single VACUCAM® EJM 2000 skidded unit, or a single hopper (PH210 Bulk Bag Surge Hopper) with dual bulk bag unloading capability. The Sanitary CIP Design Hoppers are equipped with vibrating screens at the inlet, bulk bag support frames with Hugger bulk bag massager, Load Cells, Air-Cone Hopper discharger, and other options for total automation and hands-free operation.